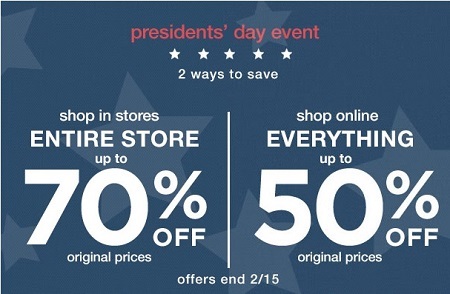 You have 2 ways to save money during Presidents' Day Event at US Gap Factory store locations and online. First way is to receive up to 70% discounts on selected styles during in-store shopping or the second way is to receive up to 50% discounts during online purchase. Source of the information is Gap. For more details visit your nearest Gap Factory store location. Offer expires 02/15/2016.